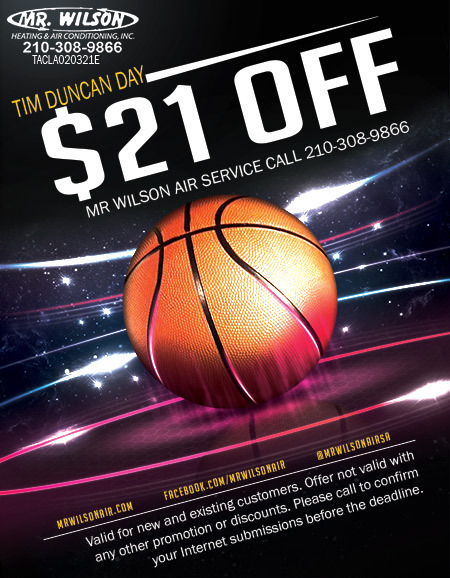 Tim and Patty Wilson are pleased to offer $21.00 off service calls today only in honor of San Antonio’s Tim Duncan Day! As long time neighbors and business owners in San Antonio most of our neighbors are Spurs fans. In fact, probably the vast majority of San Antonio are Spurs fans. It only seems appropriate, and well a little fun to give our current and new customers a nice little discount today. The service call discount comes at a perfect time. Air conditioners are running days on end with the heat constantly beating down on our homes and businesses. Service calls at the early stages of system issues can help fix small issues before they become larger issues. More often than not our AC repair technicians find issues that can be labeled as “time to save” so our customers are prepared for a worn out motor ready to quit. So give us a call today by 4PM CST to schedule your service call and take $21.00 off!